The Wellness Spotlight Series highlights military spouses and their real world health and wellness journeys in a Facebook Live series. Below is an excerpt of Reda's feature. 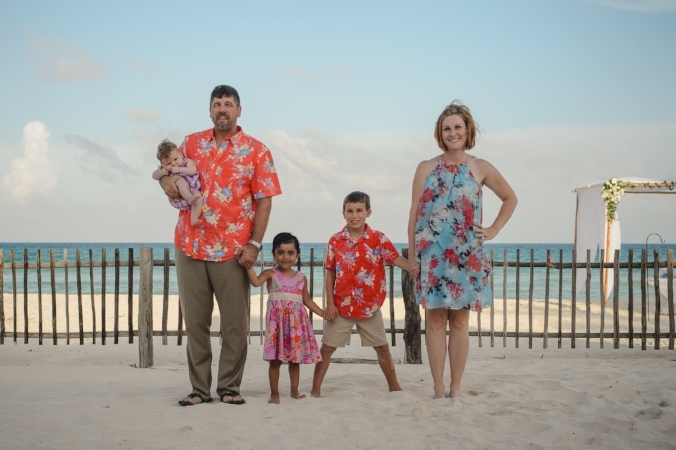 Reda Hicks, wife of a retired Army Special forces soldier, shares how she made a deployment endurable for herself and her young son, and how connections with friends are her favorite form of self-care. In 2007, I was a practicing attorney in a Houston law firm, and was representing the Province of Marinduque Philippines in a large piece of environmental litigation. I was also working with the national government of the Republic of the Philippines on mining policy. So I traveled to Manila quite a lot. On one of those trips, I met Jake at an outdoor tapas bar. He was deployed with First Group (out of what was then Ft. Lewis—not so close to Houston) in the Philippines, and I caught him passing through. We hit it off, decided to keep in touch, and became pen pals. Eventually, we started traveling to see one another. We married in 2009, and have been together (although really not together) ever since. From 2007 to 2015, we lived geobach, with me in Houston and Jake at Ft. Lewis/Ft. Rucker/Ft. Polk/Ft. Riley and a deployment to Afghanistan thrown in for good measure. By the time our oldest was five, he’d probably spent only about 400 days with his dad. My lowest low as a military spouse came while Jake was deployed. We were a geobach family, so it took a couple of months for my son, then four, to realize his dad wasn’t coming home on weekends anymore. When it hit him, it hit him hard. By the fifth or sixth tearful day in a row of explaining Daddy would be gone for “awhile,” I hit a wall. And there was no one I knew in Houston who was dealing with the same thing. No one to give me good ideas, or even cry with me over a bottle of wine. I read something that gave me an idea. I made a paper chain with a link for every remaining day of the deployment. It was HUGE! It wrapped around the banister of our stairs from the top to the bottom with links to spare. But you know what? Putting a tangible description to the challenge worked. It gave my son a visual to understand—it’s long, but getting shorter—and bought me peace of mind from two hours of work. I learned a valuable lesson. If you can distill a challenge into something tangible, put something finite to it, it’s often easier to tackle. Or at least to endure. My favorite form of self-care is being intentional about carving out regular time to spend with friends with no agenda. It is so energizing and buoying to me to spend time with my favorite people, having dinner or drinks, or just hanging out. When I neglect to carve out that quality time, I feel it. My energy starts to wane, and I start thinking that it’s me against the world. I need the centering time to remind myself that it’s almost never us against the world, that we have people in our corner and we’re loved. I love the My Fitness Pal app because it’s a really easy way to take a pulse on what I’m eating, keep track of whether/when I’m exercising, and get praise for consistency and good choices. Because who doesn’t like being told when they’re doing a good job? The two books I’ve read over and over again are The Great Gatsby by F. Scott Fitzgerald and Mere Christianity by C.S. Lewis. The Great Gatsby is just a guilty pleasure read—I love to get lost in the devastatingly beautiful prose that Fitzgerald weaves throughout the novel. Mere Christianity has really been balm for the soul. C.S. Lewis has beautifully and simply distilled what it is to be a Christian. But what’s more important is the book’s history. Mere Christianity is actually a compilation of the radio broadcasts that C.S. Lewis did in the U.K. during World War II. Winston Churchill asked him to do it. The people needed hope, and C.S. Lewis would serve up hope in every living room in the U.K. every week during the dark days of the war. It was said that only Churchill’s own voice was more well-known than that of Lewis. When I read Mere Christianity, I realize that we need the same kind of hope today, some seventy-plus years later. Reda Hicks is the wife of a retired Army Special Forces soldier, mom of three, attorney, advocate, civic leader, and Founder and CEO of GotSpot, Inc., which is AirBnB for commercial spaces. She’s based in Houston, Texas and we loves her community there. She’s very active in civic organizations like Leadership Houston, Texas Lyceum, League of Women Voters, and Sketch City (Houston Hackathon), and she also works with the military-affiliated community in Houston and Texas through Bunker Labs, Lone Star Veteran Association, and the Texas Veteran Spouse Network. She also has the honor of serving on the advisory board of the Military Family Advisory Network.